Your financial support of the Northside Farmers Market (NFM) supports local small farmers and businesses AND makes a positive impact upon our community. Northside Farmers Market is an important part of our community, a community that doesn't have a grocery store. We offer opportunities for low-income individuals to purchase fresh local foods through a $10 weekly matching program, kids activities which educate about healthy eating and cooking, a place for neighbors to shop, listen to music, and enjoy local products. On behalf of all those we serve – low income households, local farmers, small businesses, and the community at large, we are asking you to make a gift to support the market’s ongoing operations. Every tax deductible gift will make a difference in the lives of many and insures that you can shop locally and conveniently. Make a secure online donation bellow, or drop a check off at the market, or send to PO Box 19398, Cincinnati, OH 445219. 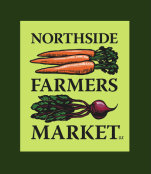 Checks should be made payable to the Northside Community Council, placing "Northside Farmers Market" in the Memo line.